When I tell people in Portland, Oregon that I moved here a year and a half ago from Little Rock, Arkansas, they always ask how I like it and how different it is. The similarity is that both are very food oriented communities, utilizing the freshest local ingredients possible in the most sustainable way possible. The biggest difference is probably the fresh seafood available in a city near the great Pacific Ocean versus a landlocked smaller city. We even have local salt! In many different flavors. These can be sampled at so many local farmers markets, whether you are in the city or on the coast. A banker friend recently revealed that his favorite ingredient in cooking was Jacobsen garlic salt, and so I had to try it! Here's how I used it! Preheat the oven to 400 degrees. 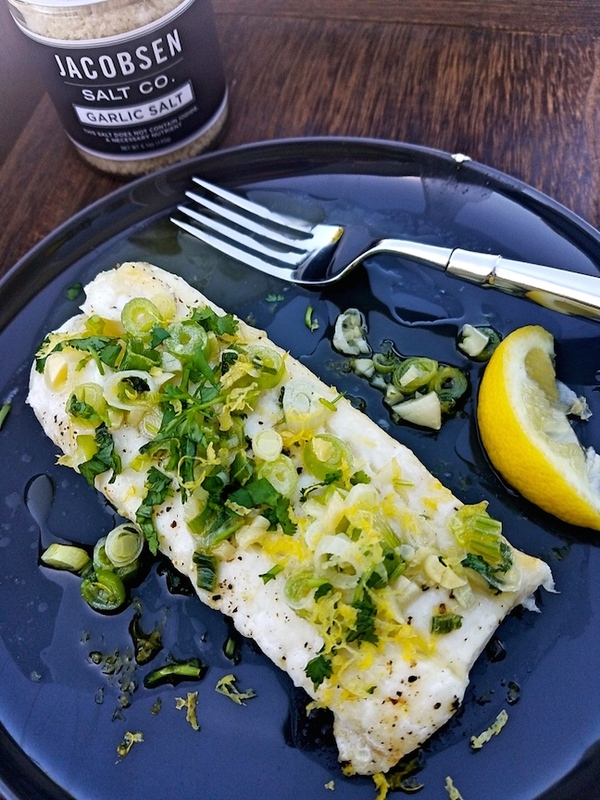 Place the cod onto a parchment lined pan. Season with a pinch of garlic salt. Set timer for 20 minutes. In a small pan, melt 2 tbsp butter with green onions and garlic cloves. Add lemon juice and stir. When the cod is finished, top with butter mixture, grated lemon zest, and cilantro. That's a great recipe! I definitely want to write a review of Unemployedprofessors on it after I try to cook it.